If you are a registered person under GST, then you are eligible to avail input tax credit for tax paid on your purchase of goods and services which are used for providing output goods and services. That is tax on inputs which are used for business purpose will be considered as eligible ITC. However, there are some goods and services on which ITC cannot be availed and is blocked which we discuss in this article. The items on which ITC cannot be availed must be recorded in the books at a price inclusive of GST. ITC cannot be availed on motor vehicles and conveyances even if the same is used in business. eg: ABC Ltd. a manufacturing company purchases a tempo traveller for transportation of employees. Here, ITC is not available to ABC as the tempo traveller is used for transportation of employees and not for goods. eg: Amba Motors is a car dealer and purchases cars from car manufacturer on which GST was Rs. 10 Lakhs. He further sells such car and his output GST liability on such sale is Rs. 14 Lakhs. Now as a dealer in motor vehicles he can claim ITC of Rs. 10 Lakhs and shall pay net tax liability of Rs. 4 Lakhs (14-10). eg: Sunil Tour & Travellers are in the business of transportation of passengers from Delhi to Himachal Pradesh purchased a tempo traveller. Here, GST on tempo traveller can be claimed as ITC as they are engaged in providing transportation services to passengers. eg: A driving school purchased few cars for imparting training of car driving. GST paid on purchase of such cars can be claimed as ITC. eg: XYZ Ltd a manufacturer purchased a truck for transportation of goods from one place to another. Here, GST paid on purchase of such truck can be claimed as ITC as the truck is for transportation of goods. eg: GST on Food and beverages served at an office party cannot be claimed as ITC. However, there is an exception that if you are using the above-stated goods and services for making an outward taxable supply of same goods or services or as an element of a taxable composite or mixed supply then ITC can be claimed on such goods and services. eg: If an Event Management Company organizes the office party and purchases foods and beverages for such party, then Event Management Company can avail ITC on such food & beverages. The club, health and fitness centre, charges GST on the membership fees charged by them from their members. ITC on membership fees/ subscription cannot be availed. eg: XYZ Ltd. takes membership of a sports club for employees and paid GST on membership fees paid on behalf of employees. XYZ Ltd. cannot claim ITC on such membership fees payment. In case the government notifies any services which are obligatory to be provided to employees of the company by the employer under any law for the time being in force. eg: If government made it mandatory for employers to insure the health of employees, then GST paid on the purchase of health insurance can be availed as ITC by employer. If input goods/services are of same category as outward supply of goods/services or as an element of a taxable composite or mixed supply. eg: Ram Cab Services Ltd takes the cab of Shyam Cab Services Ltd for providing rent-a-cab service to a customer. Then Ram Cab Services Ltd can avail ITC of GST paid on services received from Shyam cab services Ltd.
ITC is not available in case any travel benefits extended to employees on vacation such as leave or home travel concessions. eg: ABC Ltd. pays for holiday packages of top 10 employees of the year. Then GST paid on purchasing such holiday packages cannot be availed as ITC by ABC Ltd. However, ITC can be availed for travel for a business purpose. ITC shall not be available for any work contract services. Work contract service if used for the construction of immovable property then same is ineligible as ITC. However, ITC can be claimed where work contract service is used for further supply of work contract service. eg: J&J Contractors hires LMN Contractors for construction of a factory building. Then J&J Contractors can avail ITC of GST charged by LMN Contractors. ITC cannot be availed in case of goods or services or both used for the construction of immovable property on its own account. Even ITC shall not be available if such goods or services are used in the course or furtherance of business. eg: XYZ Manufacture Ltd. constructs an office near factory. GST paid on the purchase of goods or services used in the construction of office cannot be claimed as ITC. However, there is an exception for ITC on the Immovable property can be claimed in case of goods or services or both used for manufacture/ construction of plant or machinery for own use. eg: XYZ Manufacturers Ltd. constructs a furnace to produce goods. ITC can be availed on goods/ services used for the construction of furnace. ITC of GST paid to composite dealers shall not be available to the recipient of service. eg: Company purchased printing papers from a wholesaler who is a composite dealer; here ITC cannot be availed by the company. Where a non-resident taxable person received any goods or services or both then ITC cannot be available to him. However, ITC is only available on goods imported by him. No ITC shall be available in case of goods or services used for personal consumption. However, if goods or services are used partly for business purpose and partly for personal purpose then ITC can be claimed for a proportionate amount of GST paid on goods or services used for business purpose. ITC is not available for goods destroyed, lost, stolen and written off by way of gift or distributed as free samples. 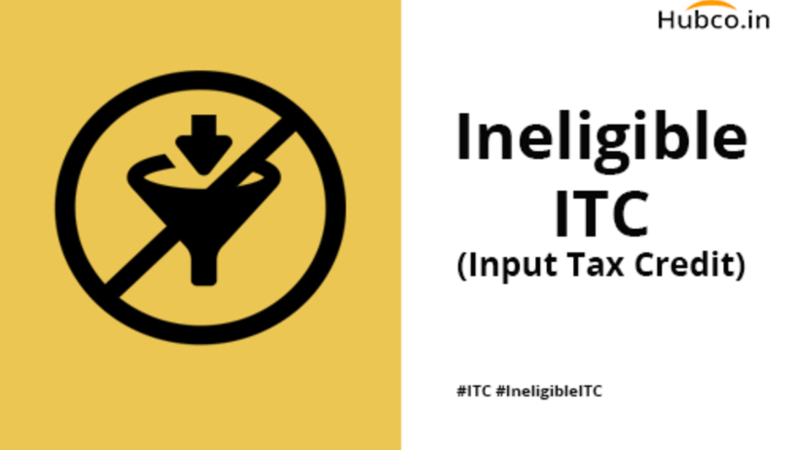 In case of subsequent loss, theft and destruction, the ITC availed earlier needs to be reversed. by reason of fraud or any wilful misstatement or suppression of facts. Tax paid on detention, seizure and release of goods and conveyances in transit. Tax paid on confiscation of goods or conveyances and levy of penalty. Standalone restaurants which are not the part of hotels will charge only 5% GST but cannot avail ITC on inputs as per the notification issued by the government. eg: KFC will charge 5% GST and cannot avail ITC. You can connect with Hubco.in by click here or post your query on info@hubco.in, where expert CA’s help you out in all your queries related to GST.